Proprietors Dave and Mary Lawrence are proud to work with our caring staff to meet the needs of local families in the Buckie area. We were recently pleased to announce the opening of our new purpose built facility at 25 East Cathcart Street in Buckie. Our fleet of immaculate modern vehicles ensure a graceful, dignified funeral. In an arrangement with the Church of Christ, Joe Dawson Funeral Directors are able to offer a private chapel for those with no links back to a church or those who would just prefer a service away from the public gaze. Joe Dawson Funeral Directors is run by Buckie couple David and Mary Lawrence, we were recently pleased to announce the opening of our new purpose built facility at 25 East Cathcart Street in Buckie. 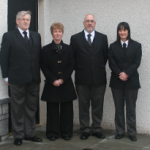 Since both Joe Dawson and Billy Mair retired in 2011 we are the only truly local independent Funeral Directors who belong to and live in the town. We believe in the personal touch from start to finish, an initial phone call is always answered personally 24 hours a day by ourselves or by our trusted local staff. We maintain local standards and traditions whilst also being able to move with the times well aware that the ability to adapt to changing requirements is becoming more important to some families. From the first contact onwards the requirements of the family of the deceased take precedent, your loved one will be taken into care immediately taking initial arrangements or we will make a personal visit to the family in your own home at a time to suit you. 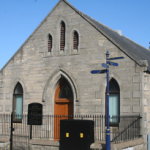 In our new premises we provide a bright, airy, relaxing and thoroughly modern building incorporating 3 rest rooms designed to allow plenty of space and a large reception area which can also be used as a chapel for a small services. We have a purpose built room for the preparation of the deceased incorporating the latest technologies and health and safety requirements. We are a local couple keeping local traditions. The business name of Joe Dawson remains the same. We were clear from the start that we didn’t want to change the name or any of the values Joe Dawson Funeral Director Buckie has stood for in the past. 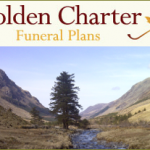 Dave, Mary and our staff are happy to answer any questions about pre-paid funeral plans from Golden Charter which are becoming increasingly popular. Please get in touch to arrange an informal chat about funeral planning.